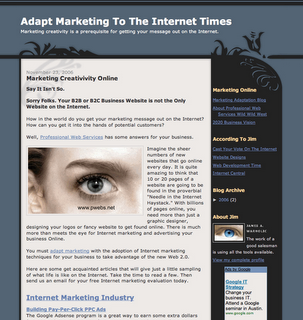 Tired of getting spam with your email address published on a website or blog? Well, using an email form mail solution might be just the ticket for you. FormLogix, EmailMeForm, and Wufoo are a few of the free online programs that you can build custom forms online and then publish them on any website, blog, or provide a link, url, or mail to anyone in order to collect information of all types. Some examples of uses would include to get more information about a company, product, or service. Use a form to sign up for a newsletter. Collect information for email updates and other reminders. With FormLogix, EmailMeForm, and Wufoo formmails, a company, person, or organization can customize their own form that will automatically respond back to the sender and collect the information in a database file for future reference by the creator of the form. For an example of how a form can be embedded into a blog or website, take a look at the form at the bottom of the postings at According to Jim. This Web form is used on some of Professional Web Services, Inc. various Web sites in order for readers and visitors to request various forms of additional information including: Internet marketing services, SEO, Search Engine Optimization information, Website customizations, professional blog creation, online advertising campaign management, and quality link offers. Here is another example of a form embedded into a page of a cool looking website. To embed a form in a blog posting, use the form in an Iframe output. Don’t worry if you don’t know what an iFrame is. Simply create the form and select publishing options, then copy and paste into the blog itself with the iframe option. Forms can be created from scratch using the provided online template editor and creator program. Templates are also provided in which full customization can be used to fine tune the form to a particular need. From a standpoint of being able to communicate online, using an Internet form provides great versatility for delivering information to someone interested in what ever is being offered. Forms help eliminate a great number of spam messages that would be generated to a publisher when that publisher provides an email address on the Internet. This is an ideal Internet marketing strategy of having online forms, and can help prompt the reader into requesting the pertinent information as quickly and succinctly as possible. Give it a try. I think you will be pleasantly surprised how well FormLogix, EmailMeForm, and Wufoo form mail works. Professional blogs, for professional people, for professional companies, are keys to online marketing success. A blog is for your B2B or B2C business, and more importantly, a professional blog is key for your business when communicating with customers and potential customers. Blogs are simply websites that are easy to use. Forget the stigma, if you have one, about blogs just being online journals or someplace where your friend sends you to read the latest personal updates about his or her life. No, no, no, you have the wrong idea all together. Blogs are for any business that wants to have an additional market outlet online. I can’t begin to tell you the importance of having a professional blog for your business. Let’s start with the most obvious though. A professional blog is a place to write about current events for the corporation and for customers to be able to read about it online. Customers want to know what is happening with companies today. Not only that, customers become much more in tune with a corporation’s brand when they are able to read about the products or services provided in a non-formal way. New customers are much more inclined to becoming lifelong customers if they can sense the company’s ethics, or how the company treats their customers in a professional business manner. By having a professional blog, a company can share those thoughts with their readership online. Staying up-to-date with the business is another key area for reasons for publishing a professional blog. One blog may not be enough for your company. This is especially true in light of the increased diversity of many corporations today. Simply having one corporate blog is not good enough. Each and every division should incorporated a professional blog into the strategic communications and marketing strategy. This has the benefit of being able to succinctly keep up with each particular aspect of the business. Then it is simply a matter of creating links to the other business units and tying them all together in the navigation menu. Professional Blogs For The Intranet. The Intranet is the internal Internet of the corporation. A good Intranet can help corporations run much more efficiently. Having an Intranet blog or in the case of many divisions, having Intranet blogs are one of the ways to help managers and employees stay in touch with one another on the various projects. Imagine the managers able to see in an instance of what the status of a project is without calling a group meeting. Talk about time savings, this could cut out those daily half hour to one hour meetings which eat up time for many of the individuals in the meetings to begin with. Good Internet marketing strategies are key to online B2B and B2C marketing success.